Discover a new degree of financial control with a partner geared to help your business succeed. A turnkey financial business strategy is just a phone call away. Fundamental financial choices. At Bank of Sun Prairie the difference you’ll find with our business banking team is, we get it. We have first-hand experience with the day-to-day needs your business needs to operate with. Bank of Sun Prairie offers a full range of business banking services such as business loans, cash flow management, accounts receivable, accounts payable, electronic banking and more to support your business. Our goal is to be with you step-by-step as you consider financial choices that impact y our business operation and future growth potential. Your business is a source of pride and accomplishment that few understand like us. Bank of Sun Prairie’s business banking team has proudly been partnering with businesses – big and small – to overcome challenges and leverage opportunities. Our value is realized when you (and your team) can focus on leading the business forward and not on the checks and balances of day-to-day financial hiccups. Flexible loan financing: Lines of credit, small business loans, commercial real estate loans, letters of credit and government guaranteed loans. Our decisions are made locally which means we are able to make decisions quick and we have the local insight and financial power to help move your business forward. Business Checking and Savings accounts: Essential to any business or not-for-profit organization is a business checking account. Adding a business savings and money market account extend your ability to be financially responsible with your business funds. Corporate credit cards: Make essential business purchases whenever you need with our Visa business credit cards. With no annual fees, this card provides a convenient way to manage employee expenses and essential company purchases. Business operation services: Enjoy the benefits of ACH, mobile banking, merchant services and more. Our experience with business operations has put us in the front seat of understanding the business tools necessary to succeed. 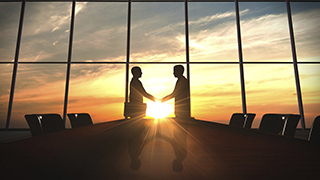 Trust and business succession: Preparing for life moments is not just a personal matter. For individual retirement accounts to estate planning for your business, Bank of Sun Prairie is your partner for all stages in life. At Bank of Sun Prairie, our business banking team is known for being just a phone call away (no operated directory to shuffle through). Try it today and talk to one of our experienced, local business bankers and let’s get started today! Call Bank of Sun Prairie at 608-467-1767.